The feds might remove the Chiloquin Dam, which caused the decline of suckers. Send comments by May 27th. Comment info at bottom of page. 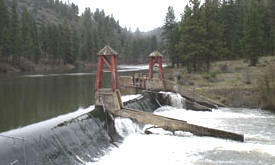 Chiloquin Dam, a diversion dam 30 miles north of Klamath Falls on the Sprague River, was the cause of suckers being listed as endangered in 1988. The sucker listing resulted in stored irrigation water being withheld from 1400 family farms in the Klamath Irrigation Project. A biological opinion said the suckers needed more water. The community has suffered bankruptcies, suicides, auctions, $200 million in economic loss, and over 200 dry domestic and irrigation wells due to the sucker listing. 489 species of wildlife suffered. This year over 100,000 acre feet of water is being taken from the Klamath irrigators in the form of a ‘water bank’ to add higher-than-historic water levels to Klamath Lake and Klamath river for ‘endangered’ suckers and coho, drying up fields and aquifers. Fish and Wildlife plans to buy, for millions of dollars, Barnes Ranch for sucker habitat this year. The Klamath Water Users Association proposed its removal in its 1993 and 2001 sucker recovery plans, but nothing was done. The dam was constructed in 1913-14 by the Klamath Agency with assistance from the Bureau of Indian Affairs and diverts water to a canal supplying the Modoc Point Irrigation District (Stern, 1990). Today, the dam is in a severe state of disrepair and the existing fish ladder is obsolete, poorly maintained, and is not effectively used by the endangered suckers. Blockage of fish at the dam forces the fish to go downstream where spawning and rearing habitat is limited. Congressman Greg Walden crafted legislation to study fish passage at Chiloquin Dam that was included in the 2002 Farm Bill. A work group was established by the U.S. Bureau of Reclamation in July 2003, consisting of state and federal agency scientists, the Klamath Tribes, Sprague River irrigators, environmental interests, and the Klamath Water Users Association (KWUA). They agreed that complete removal of Chiloquin Dam likely provides the best biological benefits to endangered sucker fish. Dave Vogel, a fisheries biologist with KWUA, was encouraged by the wide support for dam removal: "It is evident that dam removal provides the greatest opportunity for sucker recovery," said Vogel. "Fish passage at Chiloquin Dam was the primary reason the suckers were listed as endangered in 1988 and, in our opinion, is the primary factor limiting recovery of the species." After over a million dollars of further study, the U.S. Bureau of Indian Affairs has developed an environmental assessment describing impacts from dam removal and other options. They have proposed to begin removing the dam this summer. The document is open for public comment until May 27. Hard copies of the environmental assessment are available from the U.S. Bureau of Reclamation Office at 6600 Washburn Way or at the Klamath Tribal Headquarters at 501 Chiloquin Blvd. or at the Chiloquin Community Center Library, 140 S. First St. A compact disc is available upon request from Melissa Bond at (503) 231-6779. Written comments regarding the dam will be accepted at: Bureau of Indian Affairs, 911 NE 11th Ave., Portland, OR 97232 - Attention, June Boynton, Environmental Protection Specialist. For more information, call Boynton at (503) 231-6749.